1. Just how large is the Pet Industry? In our country, we spent over $69 Billion in 2017 in caring for pets. For 2018 that number is predicted to be over $72 Billion. 68% of the American households own a pet, which translates to approximately 84.6 million households. 2. What are the characteristics of our market? The Pet Boarding Market is STABLE and has proven to be recession resistant. When most retailers were experiencing major difficulties during national crisis and during recessions, the pet industry did exceptionally well. Pets Are Inn customers still traveled. Yes, whether for business or pleasure, Americans are traveling at an unprecedented rate. 78% of the US population took vacations last year. 3. Is the Pet Industry growing? The idea of pet ownership remains firmly embedded in the American psyche. No matter where American pet owners live and whatever their age or ethnicity, they stand united in believing that their pets make a positive contribution to their lives. For example, more than 90% of dog owners across a wide range of demographic segments agree that their dog has a positive impact on their mental or physical health. The report also identifies a number of demographic trends that likely will hearten marketers and retailers in the pet industry. For one thing, Millenials clearly have bought into the idea of pet ownership. Those in the 18 to 34-year-old group age already have the highest likelihood of owning a pet, while 43% of those in this key demographic who do not have a pet now say they want one in the future. Again Boomers offer another, perhaps unexpected, bright spot for the American pet industry. A decade ago, just 34% of adults in the 70-and-over age group owned pets. In 2015 and 2016, when the leading edge of the Boomer generation began to turn 70, this percentage jumped to around 40%. If this incipient trend continues, the overall rate of pet ownership will likely increase in coming years. 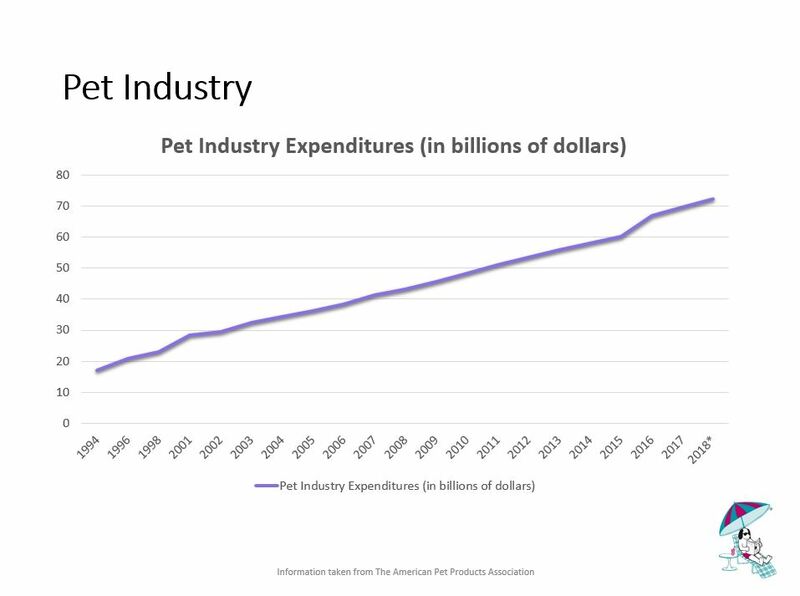 The Pet Industry has grown roughly 4% every year, even through the recession years of 2007-2009. 4. Why not use a kennel? Animals that are used to being in a kennel such as hunting dogs can handle the stress associated with a kennel. Unfortunately, because of their very nature, kennels cannot provide the care and environment that domestic pets and their owners prefer. Currently, there are between six and seven thousand boarding kennels scattered throughout the US. Many are located in areas that are difficult or time consuming to reach for the vast majority of their customers (primarily city dweller and suburbanites). Some are better than others, but all suffer from a tainted reputation because kennels in the past have been poorly maintained and under staffed. Not to mention the possibility that tragedies such as fires have been devastating. Kennels, because of the volume of pets they board in close quarters, are breeding grounds for kennel cough, fleas, and other health related problems. 5. Where does Pets Are Inn fit into the big picture? Fact is, when a family goes on vacation, they would prefer having their pet cared for in a loving…caring…“home environment.” Pets Are Inn provides that environment. 6. Who are our customers? What do they want? With over 84 million US households owning a pet, this represents approximately 220 million pets of all types and varieties. Even though we have lodged numerous pets of all types, the “bread and butter” of our business is CATS and DOGS with dogs being approximately 90% of our boarding activity. Our customers are these pets and their owners. Pets are special to these families. They are attuned to their pet’s psychological and emotional well being more now than at any other time in recent history. They want a boarding service where people are caring, enthusiastic, and knowledgeable about pets. That’s Pets Are Inn! As you learn more about Pets Are Inn, you will see why we are positioned to meet the specific needs of the marketplace. Pets Are Inn offers a unique way of serving this market.